We were really lucky at Telesfora Beach Cottages to be able to use their kayaks to explore the waters around Corong Corong Beach and El Nido. We paddled to several stunning white sand beaches over the course of our stay at Telesfora, each one more beautiful than the last. The paddling itself is also a treat. The towering cliffs that line the shoreline are even more majestic viewed from the water just below. There are also little passages and outcroppings to paddle around that make the journey even more interesting. Most days the water was calm making for easy paddling. On the water off Papaya Beach. 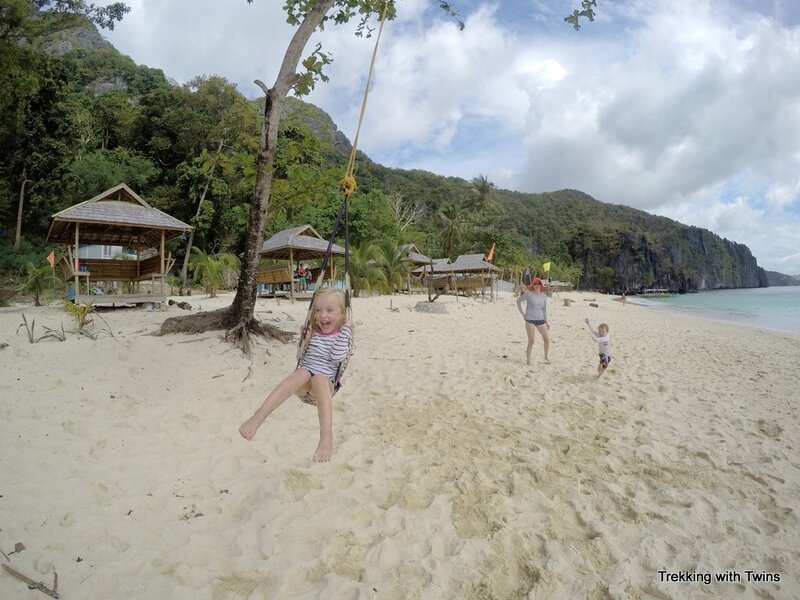 Telesfora Beach Cottages is located on Corong Corong beach, just south of El Nido proper. Between Corong Corong and El Nido are tons of beaches, both isolated and developed. 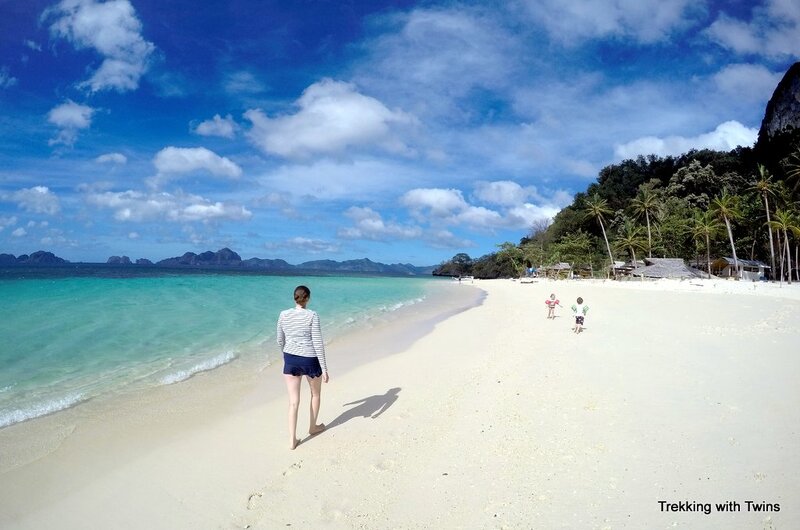 We explored several of the beaches along this stretch of Palawan coastline. One of the best is Papaya Beach, in the next cove north of Corong Corong. Papaya Beach is actually adjacent to 7 Commando Beach which is a stop on the El Nido island hopping Tour A. Most of the boats don’t stop at Papaya Beach though, and most of the times we paddled over there we had the beach to ourselves or shared with just one or two other kayakers. Our “private” beach – Papaya Beach. The best part of Papaya Beach is the snorkeling. There is a reef just off the shore, literally a few feet from the sand. 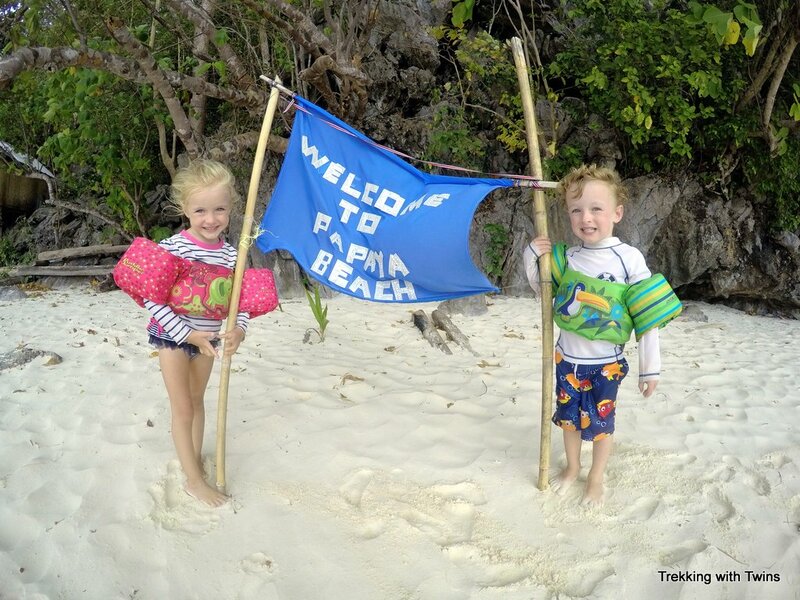 This is the place the twins had their first experience with real snorkeling, and they have been hooked ever since. We saw a bunch of anemones with clown fish (Nemo! ), as well as really interesting coral topography and other reef fish. We even saw a cool puffer fish swimming along. 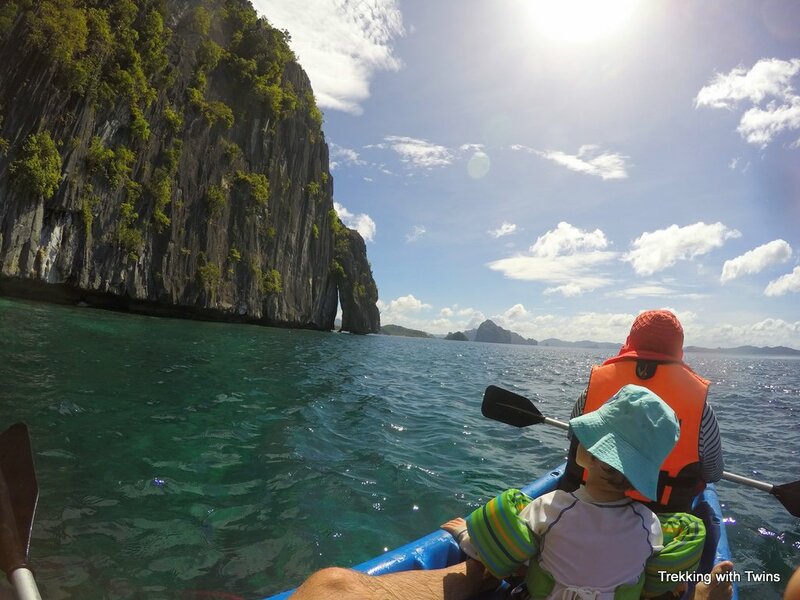 Excited to kayak in El Nido? 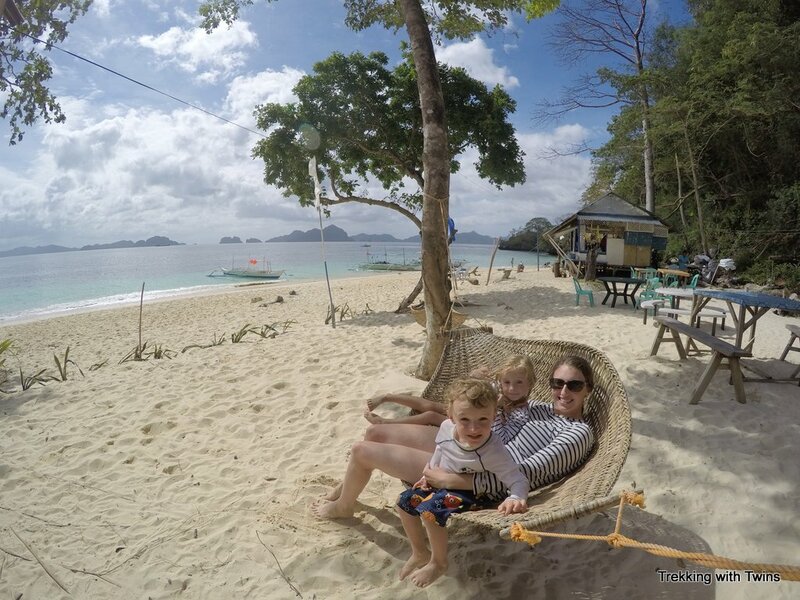 Read about our favorite accommodations in the Philippines: Telesfora Beach Cottages, or check rates right now on Agoda. Telesfora lends kayaks to guests for free! 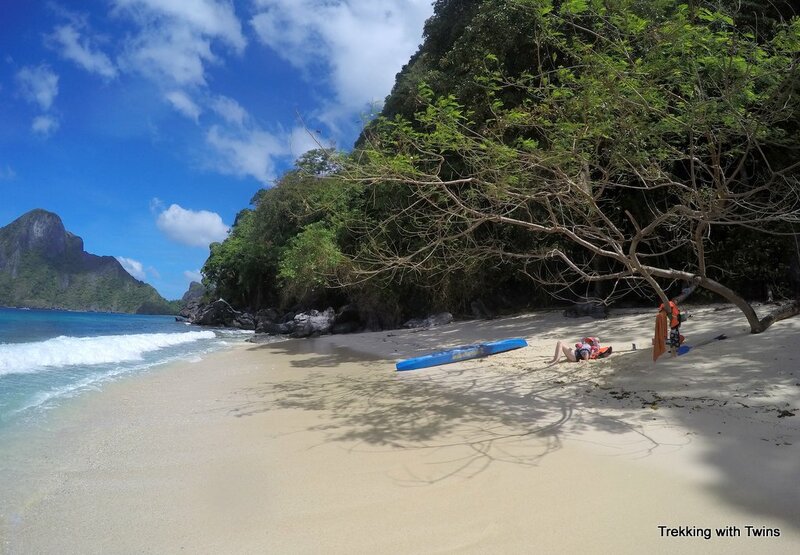 7 Commando Beach, also known as Halo Halo Beach by our twins, is right next to Papaya Beach. The two are separated by a big rock outcropping and you wouldn’t know they were so close if you were sitting on either one. Lots of banca boats stop at 7 Commando Beach because it’s part of the standard El Nido island hopping package Tour A, so it’s often very busy. We’ve went there a few times by kayak though and had the beach to ourselves. The middle of the day is probably best for this, as the bancas seem to stop at 7 Commando Beach either first or last on the Tour A itinerary. We often had 7 Commando Beach to ourselves. 7 Commando Beach has gorgeous white sand and good swimming, but what really sets it apart are the delicious halo halos available at the snack stand. For 100 pesos apiece you can’t go wrong and after starting off ordering 2 to share we quickly graduated to ordering one for everyone. The snack stand also sells a variety of other food and drinks. Halo halo means “mixed up” and it’s a traditional Filipino treat. Basically it’s crushed ice mixed with a couple dozen ingredients including a variety of beans, coconut, fruit flavored jellies, dried mangos, sweetened condensed milk, and ube paste. Sounds weird, tastes delicious. There are a bunch of bamboo huts along the beach with benches inside where you can enjoy your halo halo or just relax. There’s also a few hammocks and a fun swing dangling from a tree overhanging the beach. Swinging from the trees on 7 Commando Beach. Loving the hammock at 7 Commando Beach. Ok so Jasper made up the name “Big Waves Beach”. It’s appropriate though. 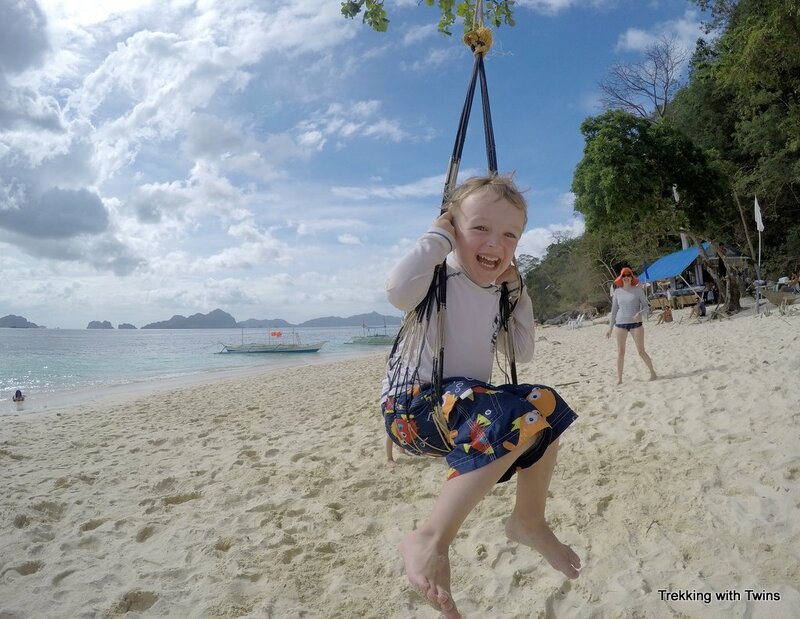 After building our confidence kayaking to Papaya Beach and 7 Commando Beach a few times we decided to explore further and pressed on towards El Nido. A little ways past 7 Commando Beach we found this little slice of paradise and decided to go ashore and claim our private beach for the day. Our own slice of paradise on “Big Waves Beach”. On the way in we got a good ride from some breaking waves and that was kind of fun. Kat and I quickly realized though that those same breakers would make leaving the beach an adventure. While the kids explored and played in the sand Kat and I had a hard time relaxing. We mostly strategized about how we would launch the kayak with all of our stuff and children aboard without being pummeled by the giant crashing waves. We devised a plan that basically consisted of me holding the boat steady in chest deep water while Kat loaded everyone and everything. Aurora “helped” by sprinting around the beach as Kat tried to catch her to carry her to the boat (meanwhile Jasper is less than pleased as waves crash over the bow while I try to keep it pointed towards the waves). Once Kat caught the runway princess and tossed her aboard the rest went smoothly and we got underway without incident. We stopped at 7 Commando Beach on our way back to celebrate our new beach discovery with some halo halos. Telesfora Beach Cottages, with their free kayaks, was our favorite place to stay in all of the Philippines – check current rates on Agoda. 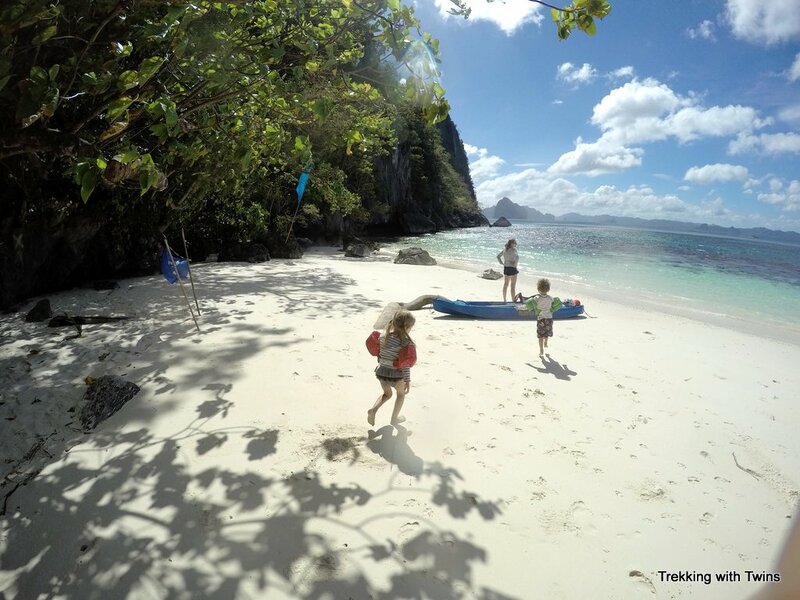 We loved kayaking in El Nido. The waters were calm on most days and we didn’t have to go far from shore to see some amazing sights from our Corong Corong Beach home base. Using the kayak was a fun and cost effective alternative water activity on days we didn’t do an island hopping tour. Telesfora Beach Cottages lets guests use their kayaks free of charge, which is great since most places rent them for at least 500 pesos a day. We definitely feel inspired to do more kayaking in the future, and will keep our eyes open for opportunities as we continue our travels! More fun on the swing at 7 Commando Beach. Haha ya it’s not exactly overrun is it? Love you guys! We love you Tante! We are definitely having fun. Who said anything about coming home?? Hi Justine! Seriously! It’s so nice that now they still want to spend time with us 🙂 We love you, and miss you!